Balshaw burst onto the international scene in 2000, making his England debut against Ireland at Twickenham and went on to collect 35 caps in an injury-plagued international career. 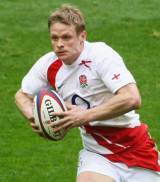 Widely considered one of the most dangerous broken-field runners in the game in is prime, he was also a member of the England squad that won that won the 2003 Rugby World Cup crown - scoring the crucial try in the win over Samoa in the group stages and coming on as a replacement against Australia in the final. The fullback/wing, who has undergone extensive shoulder and groin surgery, won three Test caps for the British & Irish Lions on their 2001 tour of Australia and was denied more through injury despite being selected for the 2005 trip to New Zealand. He was England's first choice fullback during the 2008 Six Nations under coach Brian Ashton but failed to secure a place in the Elite Player Squad when Martin Johnson took over as manager later the same year. He made his senior debut for Bath in the 1997-98 season and made his name at the Premiership club over the next seven years before moving to Leeds Tykes. Following the Tykes' relegation from the top flight in 2006 he switched to Gloucester where he stayed for two season before opting for a move to French Top 14 side Biarritz in the summer of 2009.